A man walks past damage from Hurricane Maria in Yabucoa, Puerto Rico, September 26, 2017. Disaster aid for hurricane-affected areas should focus on creating long-term resilience to extreme weather and supporting communities with the fewest resources to rebuild. As of this writing, the combined storms have killed more than 176 people in the United States, Puerto Rico, and the U.S. Virgin Islands—a toll that continues to rise.4 This will be the most expensive hurricane season ever in the United States; Harvey and Irma alone inflicted as much as $290 billion in damages.5 Recovery in all affected communities will take years. And families living paycheck to paycheck may never recover at all. As Congress considers options for responding to these catastrophes, lawmakers should do more than rush emergency aid out the door. They should heed the lessons from past disasters, such as Hurricane Katrina and Superstorm Sandy, by supporting communities in making investments built to last and by helping all those affected by Harvey, Irma, and Maria recover. The frequency and intensity of extreme weather events is on the rise, affecting four times as many U.S. counties today as 40 years ago.6 The best science says that climate change is only going to make these events worse in the future. Downpours will be more frequent and extreme, heat waves will be longer and more punishing, the sea level will rise, and hurricanes will be more powerful.7 Failure to take steps now to protect American communities from the risks they face will endanger lives, economies, and property for decades to come. Failing to prepare for more extreme weather would also waste taxpayer money. The fact is, it makes good fiscal sense for all levels of government to take immediate steps to build stronger, more resilient infrastructure and communities and to make smarter and safer decisions about where to build homes and industrial facilities. Every $1 spent on mitigation measures ahead of a disaster saves $4 down the road, according to the National Institute of Building Sciences.8 The alternative is continuing down a business-as-usual path of poorly designed infrastructure, homes, and industrial plants in flood-prone areas that will require repeated, costly repair or rebuilding and threaten the health and safety of the American people. Today’s policymakers and community leaders, however, know more than ever before about policies and programs that can help build stronger, more resilient infrastructure and housing while also ensuring that historically disadvantaged communities are neither left out of the planning process nor left behind during rebuilding. Build back better. Congressional disaster aid packages should support programs at the U.S. Department of Housing and Urban Development (HUD), the Federal Emergency Management Agency (FEMA), and other federal agencies that enable communities to plan for the future, rebuild infrastructure to higher standards, and support innovative solutions that can better withstand extreme weather and other risks. Update flood risk data—and use it. In too many cases, FEMA flood maps are out of date or otherwise inaccurate, and none of them currently take into account the anticipated impacts of climate change. Congress should support updating flood maps for areas affected by this season’s hurricanes and other high-risk communities and ensure that federally supported infrastructure is built to withstand more frequent and severe floods. Prioritize communities that have the fewest resources to rebuild. Extreme weather events hit hardest in areas struggling to make ends meet and in black and Latino communities and other communities of color already overburdened by polluted air and water. Congress should ensure that any disaster aid package prioritizes support for families who need it the most—including in Puerto Rico and the U.S. Virgin Islands—and creates rather than hinders access to economic opportunity. Plan ahead to lower the risks and costs of the next disaster. It is not a matter of if extreme weather will strike the United States but when—including in the same communities struggling to respond to this year’s hurricane season. Congress has a fiscal and moral responsibility to support innovative and equitable strategies to build long-term resilience nationwide, such as establishing a so-called disaster deductible to encourage states, counties, and cities to take steps to protect their residents before disaster strikes. Congress should support programs that will enable businesses and policymakers in disaster-affected communities to account accurately for future extreme weather and flood risks and build infrastructure to better withstand those threats. Otherwise, taxpayers will find themselves footing the bill for rebuilding the same infrastructure time after time. To help communities build back better, Congress should increase funding for effective programs that provide flexibility to make smart rebuilding decisions; support developing stronger design guidelines so that infrastructure is built to withstand extreme weather and other risks; and expand investments in clean energy and green infrastructure solutions. In the past, federal disaster relief has often required communities to build damaged structures back to the condition they were in before they were damaged. As the nation faces more frequent and extreme storms and other costly disasters, Congress must recognize that it is a waste of taxpayer dollars not to support infrastructure that is built to last. For instance, as part of the Superstorm Sandy recovery bill, Congress created the FEMA 428 program, a flexible funding stream that allowed the agency to pilot new approaches to both debris removal and long-term rebuilding.18 The Rockaway Beach neighborhood in New York City suffered some of the most severe damage from Superstorm Sandy, with thousands of homes destroyed. FEMA 428 helped finance an ambitious rebuilding of the Rockaway Beach boardwalk that not only provided recreation space but also included multiple measures to help the structure withstand future storms and protect the community beyond.19 Congress should expand the successful FEMA 428 program as part of its response to this season’s hurricanes. There are also opportunities to use other federal programs to encourage states and cities to think seriously about how they are going to build resilience to future disasters. HUD’s Community Development Block Grant program typically funnels billions of dollars to disaster areas through its Disaster Recovery Program (CDBG-DR).20 Congress should direct HUD to ask grantees to specify in their applications for funding how they plan to rebuild in ways that reduce future extreme weather and disaster risks. For states such as Texas that do not already have comprehensive resilience plans in place, this requirement could nudge state and local officials to rethink how communities are designed to withstand future threats. Congress should create a grant program to support communities affected by hurricanes Harvey, Irma, and Maria in creating their own resilient design guidelines; provide adequate funds to the U.S. Global Change Research Program, a 13-agency program that conducts the National Climate Assessment; and expand technical assistance to help states and cities interpret the assessment’s findings. Given the enormous need across the country, as well as the significant federal resources invested in designing and running the successful competition, Congress should launch a second, $2 billion round of the National Disaster Resilience Competition for communities affected by federally declared disasters from 2014 through 2017. Congress should renew and expand the tax credits for residential energy efficiency improvements, renewable energy installations, and energy-efficient heating and cooling systems that expired at the end of 2016.29 For low-income families and renters whose landlords may not choose the most efficient appliances, Congress should also consider creating a direct rebate program that would repay a portion of the cost of purchasing appliances certified by Energy Star, the federal energy efficiency program. Before this year, the nation’s worst blackout came in the wake of Superstorm Sandy. The storm also provided important lessons for how to improve the resilience and reliability of the electricity sector. A housing complex in the Bronx, for example, was able to keep the lights on during Sandy “because it is equipped with a microgrid that disconnected temporarily from the centralized power system.”30 Federal and state governments should support neighborhoods that want to build microgrids of their own. Congress should also examine where state policies undermine energy reliability and consider federal solutions. In Florida, for instance, homeowners with rooftop solar panels are legally required to connect those panels to the electric grid. State law further prohibits homeowners from generating power from their solar panels in the event of a grid outage.31 Hurricane Irma shows that this state law is not just shortsighted but also dangerous. Eleven residents have died and more became sick when a nursing home—now under criminal investigation—lost air conditioning in Florida’s power outages.32 Had that nursing home been equipped with rooftop solar panels, its staff would not have been allowed to turn them on in order to power the facility’s climate control system. Smaller-scale solutions can make a difference too. After a series of heavy downpours caused Philadelphia’s combined sewer system to overflow repeatedly in some neighborhoods, the city launched the Green City, Clean Waters program.34 The city replaced paved sidewalks with porous pavements that allow water to drain into the ground below, created small curbside gardens to absorb rainwater, installed green roofs and rain barrels, and restored local wetlands.35 Together, these measures help keep large volumes of water from overwhelming the aging combined sewer system, prevent toxic runoff from flowing into area waterways, and beautify neighborhoods at the same time. Congress should include robust funding in any hurricane aid package to help communities pursue proven green infrastructure solutions that will help reduce flood risks. The Federal Emergency Management Agency is the keeper of the nation’s flood maps—the information that informs residents of their flood risk and determines whether families are required to buy flood insurance to live in certain areas. Congress should urgently appropriate more resources for FEMA to update flood maps in Houston and beyond to accurately reflect current and anticipated risks, as well as require federally funded infrastructure to be built to a higher and safer standard. About 40 percent of homes damaged by Hurricane Harvey were located outside the 100-year floodplain—the area designated by FEMA to have a 1-in-100 chance of flooding in any one year.36 What’s more, from 1999 to 2009, some 75 percent of flood damage in parts of the Houston area occurred outside the FEMA 100-year floodplain, according to a new study from researchers at Rice University and Texas A&M University.37 In other words, this is not just a Harvey problem—it is a systematic, ongoing failure that is costing families and communities year after year. Traditionally, FEMA flood maps have relied on historical data to determine the scope of the floodplain—meaning that they do not take into account the risks communities face from more frequent and extreme downpours and sea level rise. Local politicians sometimes exert pressure to minimize the extent of the floodplain in order to avoid limiting development.38 And changes in upstream development can profoundly alter flood risk in older, downstream neighborhoods—as in the affluent Meyerland area of Houston, where the floodplain has expanded from just a small area in 1979 to cover nearly the entire neighborhood today.39 These changes track closely with the boom in suburban and exurban construction, which put buildings and pavement where water-absorbing prairies used to be. Following Hurricane Sandy, Congress appropriated funds for FEMA to update flood maps in the New York and New Jersey regions. It is clear that the agency must do the same for communities affected by hurricanes Harvey, Irma, and Maria, as well as for other high-risk communities that were not hit by hurricanes this season but are likely to be affected by future storms. Earlier this year, New York went even further and formally adopted a set of projections for climate change-driven sea level rise that will be used in planning long-term infrastructure investments.40 Congress could consider requiring other states to do the same and appropriate funds to help states assess the flood risks posed to their communities by sea level rise and increasingly severe downpours, based on the data in the National Climate Assessment. Without these standards, billions of taxpayer dollars could be spent on infrastructure not built to withstand future floods. While reports indicate that the Trump administration may be reconsidering its actions, Congress should make the decision for the administration by directing it to reinstate the federal standard. Failing that, Congress should at least require federally funded projects supported by the hurricane-relief supplemental aid package to be built two feet above the current floodplain, and three feet for critical infrastructure. In the wake of a natural disaster, families of all incomes scramble to find shelter and to rebuild their homes. However, while upper-income households often have the resources to rebuild quickly, it can take years for low- and moderate-income households to rebuild—if they rebuild at all. Working families who rent are often forced to uproot entirely when their affordable rental housing is not rebuilt. Severe storms can also cause long-lasting health problems for communities that live near Superfund sites and industrial facilities that store toxic substances or emit toxic air or water pollution; many families in these communities are living paycheck to paycheck. As communities in Texas, Florida, Puerto Rico, and the U.S. Virgin Islands pick up the pieces in the wake of Harvey, Irma and Maria, Congress must take steps to rebuild affordable housing, support homeowners in need, adequately fund toxic pollution cleanup, hold negligent companies accountable for threatening public health and safety, and give communities a seat at the table to help shape decision-making, priority-setting, and plans around rebuilding. State and local governments have a mixed track record of repairing or rebuilding this important housing stock after a natural disaster. The city of New Orleans lost more than half of its public housing residences after Hurricane Katrina.45 In the years following Hurricane Ike, only 40 out of 500 public housing units were rebuilt in Galveston, Texas.46 Nationally, public housing is currently running a $25 billion capital repairs deficit.47 As a result of decades of disinvestment, public housing authorities do not have the funds necessary to rebuild; targeted federal investment is needed. Despite the great need, affordable housing is too often overlooked by state and local governments administering federal relief dollars. Congress can help ensure that affordable housing is not overlooked by requiring CDBG-DR grantees to direct relief dollars toward the areas of greatest unmet need. Later this fall, the Department of Housing and Urban Development will publish an unmet-needs analysis of the areas affected by storms this year that can guide local decision-makers. Analysts predict that rental housing will become less affordable in Houston in the months and years following Hurricane Harvey.48 With fewer rental units in good condition available, and with more families seeking short-term rentals as they rebuild their homes, rental property owners will have leverage to raise rents. By focusing the appropriate resources toward preserving the affordable rental housing stock, state and local governments can help ensure a healthier rental market. For most families, their home is their greatest asset; losing a home means losing most of their family’s wealth. The stakes are especially high for African American and Latino communities and other communities of color living in areas affected by the storms. In Houston, the share of mortgage originations going to African American and Latino households has been on the rise—a hopeful trend in an otherwise bleak national lending environment. Thirty-two percent of mortgages originated last year went to African American and Latino borrowers, an increase of 5 percent, according to an Urban Institute analysis of the Houston area.50 A spike in foreclosures could strip wealth from many of these new homeowners. To prevent unnecessary foreclosures, Congress should direct the FHA, the U.S. Department of Veterans Affairs, the U.S. Department of Agriculture, and the Federal Housing Finance Agency, which regulates Fannie Mae and Freddie Mac, to allow hard-hit homeowners to suspend their mortgage payments for at least 12 months while they rebuild and to provide homeowners with fair repayment terms once the suspension period ends. Homeowners should also receive partial proceeds from their insurance policies so that they can secure their property in the short term to prevent further damage. In the past, mortgage services have often withheld these funds until the homeowner begins to rebuild. Congress should also ensure that low-income households have access to free housing counseling and legal services while they rebuild. In the aftermath of a natural disaster, families often need assistance assessing their options, negotiating with mortgage servicing companies or landlords to keep their home, and even pulling together the paperwork they need to qualify for the loans and grants they will need to rebuild.56 They also need help deciding how to rebuild their home to be more resilient in order to prevent future damage and manage flood insurance costs. Finally, Congress should instruct federal agencies and state and local governments to create and implement plans for reaching out to residents with limited English proficiency. In order for recovery efforts to be successful, residents with limited English proficiency must be able to access the resources they need. Congress should direct state and local officials receiving disaster aid to develop rebuilding plans that prioritize cleanup and rebuilding efforts in neighborhoods within a 5-mile radius of Superfund sites, refineries, chemical plants, and other industrial facilities that were flooded or damaged by hurricanes Harvey, Irma, and Maria. In Crosby, Texas, storage containers holding liquid organic peroxides exploded at the Arkema chemical plant after floodwaters cut off central and backup power needed to keep the 19.5 tons of volatile chemicals cool. 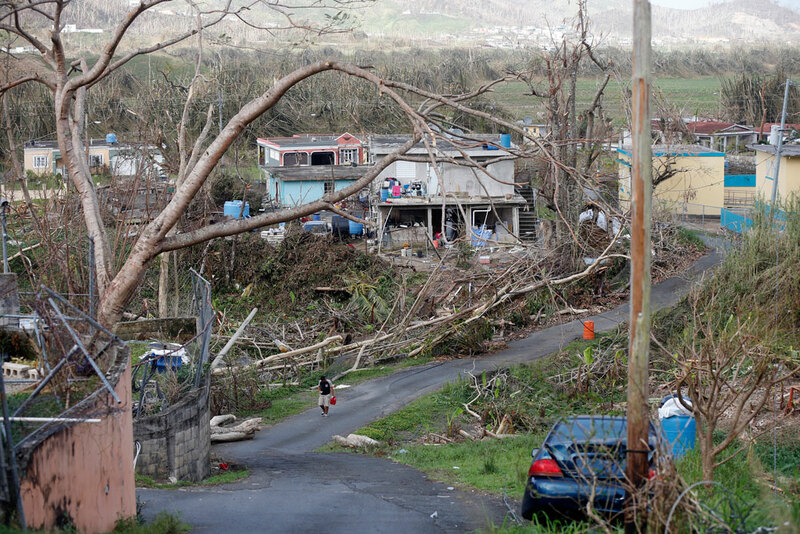 Local officials warned residents living within the 1.5-mile radius surrounding the plant to evacuate, even as the EPA downplayed the explosion’s dangers.65 The explosions overwhelmed 21 first responders with smoke, forcing them to seek immediate medical care.66 In Puerto Rico, floodwaters surged through a community where Applied Energy Systems Inc. stores a five-story mound of uncovered coal ash packed with heavy metals, including arsenic and mercury.67 Congress should direct the EPA to take enforcement action against companies responsible for avoidable or unlawful pollution releases, spills, explosions, and other gross negligence that put public health and air and water quality at risk during this hurricane season and over the long term. The EPA provides essential support to communities before and after disasters to protect public health, drinking water, and air quality. But President Trump has proposed slashing funds for Superfund cleanups by roughly 25 percent and cutting the EPA’s Superfund Emergency Response and Removal program, which helps protect communities from oil spills and sudden releases of toxic substances, by 18 percent.68 Trump’s budget would also cut EPA air and water quality monitoring, which is essential to protect communities from hazardous releases and water contamination. Congress should appropriate funds for the EPA to adequately assess the immediate and long-term public health threats linked to chemical spills, toxic air pollution, and other releases of hazardous material before, during, and after the storms and to ensure that the companies responsible for these releases take adequate steps to prevent them from occurring in the future. Congress should also include funds for the EPA to secure Superfund sites that were flooded or damaged by the storms so that they are protected from future flooding and extreme weather events. Finally, Congress should ensure that the EPA has adequate resources to continue to provide critical public health, drinking water, and air quality protections for communities across the country. The rush to rebuild in a disaster’s aftermath often puts pressure on local officials to make hasty rebuilding decisions with input from only a few politically connected stakeholders. Congress should require local officials seeking disaster aid to design inclusive processes to meaningfully engage communities in priority-setting and the design of cleanup and rebuilding plans. The National Environmental Policy Act (NEPA) provides a framework for informed governmental decision-making by requiring a careful review of the impacts of major infrastructure and rebuilding projects and requiring the federal government to conduct public outreach so that residents can voice their concerns and opinions about projects in their communities.69 Congress should direct federal agencies to fully implement NEPA public outreach, information sharing, and environmental review requirements to ensure that community members have adequate say in setting rebuilding priorities and how their neighborhoods will be reconstructed. Beyond support from FEMA to restore privately owned homes, there are few programs to help displaced families return to their communities. This year’s hurricane season highlights the need for federal and local policies to minimize the number of people uprooted from their communities by extreme weather. Congress should ensure that funding is available for adequate rental assistance for low-income families who are displaced by the storms, which can be administered through the Disaster Housing Assistance Program.73 Also, Congress can instruct HUD to ensure that any lost federally subsidized affordable housing units are rebuilt or replaced so that displaced families have the choice to return. Congress should support forward-thinking and equitable strategies to help minimize loss of life, damages, and rebuilding costs tied to future extreme weather events, including by expanding existing disaster risk reduction programs and creating new incentives for states, municipalities, and tribes to prepare before disaster strikes. But President Trump proposed slashing the PDM program by more than 60 percent, or $39 million, in his FY 2018 budget—a proposal that would cost Americans dearly.80 According to The Pew Charitable Trusts, “From 2005 to 2014, the federal government spent $277.6 billion on disaster assistance, while FEMA designated less than $600 million toward its primary pre-disaster mitigation program.”81 In other words, Congress has spent 460 times more on disaster recovery than on actions to reduce disaster risks and costs before catastrophe strikes. Green infrastructure and coastal restoration: Many of the most cost-effective disaster resilience solutions conserve, expand, and harness natural systems.89 Cities across the country are protecting and expanding natural infrastructure to soak up stormwater, absorb the impact of storm surge and sea level rise, and reduce flood risks.90 Investments in green infrastructure strategies—particularly in communities of color and low-income areas, where flood risks are disproportionately high—should count toward the federal disaster deductible. Updated design guidelines for buildings and infrastructure: State and local governments can reduce their disaster risks by revising building and infrastructure design codes to incorporate forward-looking climate data.96 Such updates should count toward meeting a federal disaster deductible. Buyout programs for repeatedly flooded properties: State and local governments should also be able to meet a portion of their disaster deductible by creating equitable buyout programs that help willing sellers of repeatedly damaged properties move to safer ground and that are designed to help address rather than exacerbate existing affordable housing shortages. Congress should encourage states that want to pursue buyout programs to replicate best practices from past initiatives. In cases where cities and counties offer voluntary buyouts in low-income areas, officials should ensure that they do not exacerbate affordable housing shortages by coupling buyouts with new investments in affordable housing units. To maximize the cost savings of buyout programs, cities and states can provide incentives to encourage willing sellers to relocate to nearby areas to preserve social networks and the state or municipal tax base. For example, after Superstorm Sandy, New York state offered a small bonus on top of paying a seller the home’s market price if the seller purchased a new home in the same county. To encourage entire flood-prone neighborhoods to participate, thereby maximizing the cost savings and resilience benefits of the program, the state also paid bonuses to groups of sellers with adjoining properties in areas with high flood risk.105 County and city leaders should also support new investments in high-density affordable housing units to help multiple families participating in a buyout program from the same community who want to stay together. In the aftermath of a disaster, policymakers have a responsibility to help residents rebuild their lives and communities. But disasters also provide rare opportunities to create new and equitable policies and incentives to make communities stronger for decades to come. These can fundamentally reshape land use practices, update building and infrastructure design codes, improve access to affordable housing, and build resilience to future extreme weather and flooding risks. Ultimately, building resilient and just communities in the areas affected by Harvey, Irma, and Maria will require state, local, and federal policymakers to tear down historic barriers to economic opportunity so that all residents have the means to prepare for and recover from the next storm. By taking the actions proposed above, Congress can lower the cost of future extreme weather disasters in terms of property damaged, taxpayer dollars spent on rebuilding, and lives lost. Kristina Costa is a senior fellow at the Center. Sarah Edelman is the director of Housing Policy at the Center. The authors would like to thank Shiva Polefka, Howard Marano, Kevin DeGood, Emily Haynes, Meghan Miller, Katherine Downs, Keenan G. Alexander, and Galen Hendricks for their contributions to this report.